Hand’s Cam Chieppo competes against Foran’s Connor Shallis on Wednesday. MILFORD — There’s a reason Foran has been one of the dominant programs over the last few years in the Southern Connecticut Conference. The Lions have had the likes of Mike Ross and Ryan Luth in recent years and have been ranked in the Connecticut Wrestling Online state top 10. This year is no different as 7th-ranked Foran beat another one of the SCC powers with a 48-25 victory over Hand Wednesday night at the Edna Fraser Gymnasium. But it’s been Foran’s depth that has been the key to their 24-2 start this year. Foran took an early 12-0 lead after the first two matches thanks to a Billy Ives pin of Matt Derken at 220 and a forfeit win at 285. But Hand roared back to take the next three matches with a Kyle Davern pin in the first period over Kyle Pokornowski in the 120-pound match giving the Tigers a 13-12 lead. The lead went back and forth over the next two matches until Foran’s Connor Shallis pinned Cam Chieppo late in the first period to give the Lions a 24-19 and they never relinquished it after that. Hand stayed close through the 152-pound bout, at 30-25, but Foran swept the final four bouts, including pins by Patrick Brogan (182 pounds) and Nolan Bannon (195 pounds) to close out the match. The best bout of the night came in the 160-pound weight class. Carter Ganino of Hand had a 2-1 lead over K.J. Pokornowski midway though the third period. However, Pokornowski used a cradle move with 40 seconds left in the match and nearly pinned Ganino. He wasn’t able to but collected two back points for a near fall to take a 3-2 victory in the bout. Foran wrestled without one of its captains, 152-pounder Mike Giordano, who suffered a broken right leg Tuesday in practice. He’ll miss the remainder of the season. 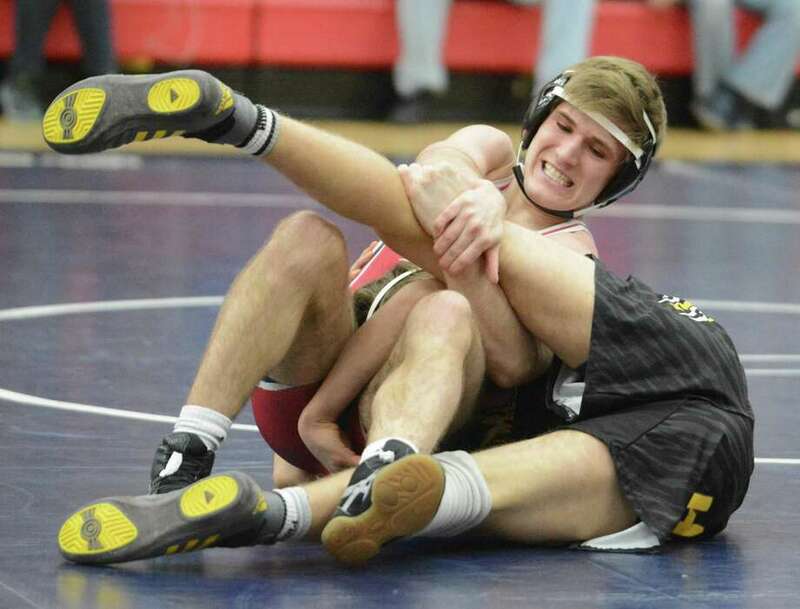 Foran’s 138-pounder Tyler Stanko was also out sick and did not wrestle. Hand fell to 10-4 for the season. 106 pounds: Sam Stein (H) def. Anthony Giordano, 17-6; 113: Zach Morro (H) def. Tanish Joshi, 6-5; 120: Kyle Davern (H) pinned Kyle Pokornowski, 1:55; 126: Jordan Lang (F) pinned Sean Portley, 1:37; 132: Jared Puricelli (H) pinned Mike Melillo, 2:35; 138: Connor Shallis (F) pinned Cam Chieppo, 1:40; 145: Ethan Edmundson (F) pinned Blake McGee, 3:37; 152: Sam Williams (H) pinned Eric Hallstrom, 1:47; 160: K.J. Pokornowski (F) def. Carter Ganino, 3-2; 170: Umer Kahn (F) def, Seamus Moriarty, 7-1; 182: Patrick Brogan (F) pinned Ian Hurley, 3:22; 195: Nolan Bannon (F) pinned Alec Dube, 3:43; 220: Billy Ives (F) pinned Matt Derken, 2:10; 285: Patrick Rescsanski (F) won by forfeit. Records: Foran, 24-2; Hand 10-4.